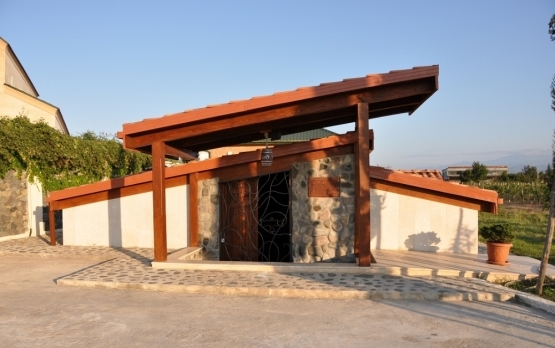 Georgia already is realizing some of its potential for wine tourism, with vintners in Kakheti, the country’s top winemaking region, offering tours and tastings. Georgia claims to be the place where winemaking was born around 8,000 years ago, though some scholars credit other locations in the general vicinity. 28.11.2012. Georgia's new economic minister says his country, beset by high unemployment and low per capita output, wants double-digit growth rates in two or three years through the injection of pro-business policies. 27.11.2012 (Hvino News). While Georgia, Armenia and Iran all played a role in ancient winemaking, preliminary evidence seems to place the very first domestication of the wild Eurasian grape Vitis vinifera in southeastern Anatolia (Turkey) sometime between 5,000 and 8,500 BC. These research findings were presented at EWBC wine conference in Izmir this month, and published by AFP today. Today Turkey is home to archaeological sites as well as vineyards of ancient grape varieties like Bogazkere and Okuzgozu, which drew the curiosity of the Swiss botanist and grape DNA researcher Jose Vouillamoz, for the clues they may offer to the origin of European wine. Together with the biomolecular archaeologist Patrick McGovern, Vouillamoz has spent nearly a decade studying the world's cultivated and wild vines. 27.11.2012. Not only Georgian now-banned wine and mineral water, but also citrus return to the Russian market very soon, Prime Minister of Georgia Bidzina Ivanishvili said the other day. In Russia this news was taken rather coldly. As it turned out, there is no real competition between Georgian and Russian producers. "The ban on the import of Moldovan wine has played a major role in the development of Russian wineries, and the ban of Georgia's wine had no effect", said the expert Eugene Kritsky. "Georgia was represented in the Russian market very modestly", the head of Horticulture and Viticulture Department of Agriculture Ministry of Krasnodar region Eugene Kritsky said. Both wine and citrus are being shipped out in small amounts. "Kindzmarauli" and "Khvanchkara" are being produced in Abkhazia and Abkhazia is accessable. So I see no big problem here". According to Kritsky, lack of Georgian goods in the market has not become an incitement to strengthen the position of domestic producers. "The ban on the import of Moldovan wine has played a major role in the development of Russian wineries, and the ban on Georgia's goods had no impact", he said. 26.11.2012. Badagoni, one of the leading wine producing companies in Georgia, is preparing to enter the Russian market, which will probably be opened to Georgian wine producers by spring 2013, according to Giorgi Salakaia, General Director of Badagoni. 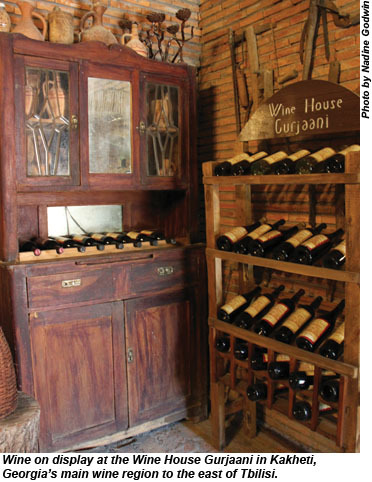 Professor Donato Lanati, who helped the company to develop, said that the wine products with which Badagoni will compete with existing brands in Russia, are produced with traditional Georgian technology. Badagoni, which was opened in 2006, quickly became known to the public due to a financial raid on it following the visit of President Saakashvili to the factory. Just a short period on from its opening financial police entered the factory and confiscated a huge amount of wine claiming reasons of its supposedly inferior quality. The company managed to garner huge popularity is spite of this fact thanks to Enosis, the globally prominent laboratory. The company subsequently reported 80 percent growth on the local market. 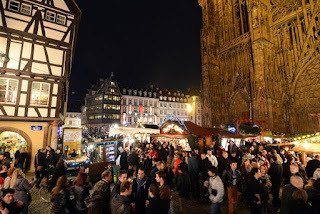 Georgian wine in Strasbourg - "Capital of Christmas"
25.11.2012 (Hvino News) This year Georgia is the "Guest of Honour" at Strasbourg Christmas Market, which opened on November 24 in France. 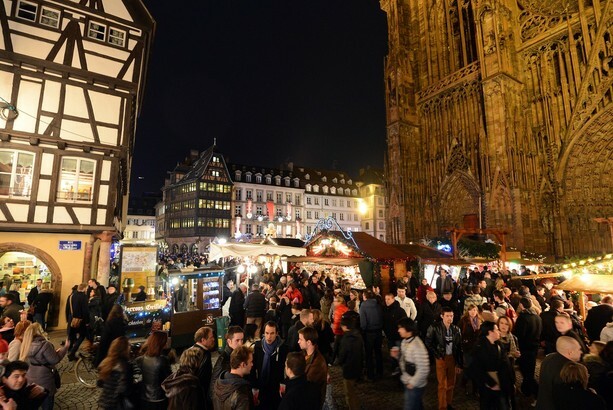 Founded in 1570, Strasbourg Christmas Market is the world's most famous one thanks to its size and location in the capital of Europe. Georgia's Minister of Culture Guram Odisharia and First Deputy Minister Alexander Margishvili attended the opening ceremony. Georgian wine is presented in the "Georgian Village", which is set up at Place Gutenberg, in the city centre. All the regions of Georgia are represented, as well as Georgian products, traditional dishes and clothing. Georgian Christmas Village will be open from 24th November to 23rd December. The organizer of the "Georgian Village" is Georgian Product Ltd.
Ivanishvili also voiced hope for a quick restoration of Georgian exports to Russia. Georgian producers of wine, mineral water, vegetables and fruits had strongly depended on the Russian market and have suffered badly since their exports were cut amid a buildup of tensions in the run-up to the war. Happy Giorgoba (St. George Day) to everyone from Hvino News! It's a public holiday in Georgia. 21.11.2012 (Hvino News) Today Badagoni held professional tasting of premium products at "Radisson Blu Iveria" hotel in Tbilisi. The event was guided by company’s partner - famous oenologist, head leading wine laboratory “Enosis” (Italy), professor of Torino Agrarian University, member of OIV Dr. Donato Lanati. Dr. Lanati introduced new products of Badagoni - Chacha Classic and Chacha Original. Among the invited guests were winemakers, sommeliers, restaurateurs, hotel chains' representatives. They tasted Khvanchkara, Saperavi Rosé and white Kakhetian Noble wine, which is Badagoni's exclusive brand. Importing countries' representatives from Ukraine, Russia, Italy and other countries have arrived in Tbilisi to attend the tasting. 19.11.2012 (Hvino News) If Georgian products come back to the Russian market, the positive results will be felt by everyone, said David Kirvalidze, Minister of Agriculture of Georgia, in his interview published today by Georgian weekly Kviris Palitra. "The Russian market will open gradually ... I know that companies wanted to export their products to Russia, but were forced to say they did not. Factors such as a new prime minister, change of government, and our repeated statements regarding desire to return to Russian market, have opened up new opportunities,"- said the Minister. Speaking about the prospects of Georgian wine exports to Russia, Mr. Kirvalidze stressed that the wine is of high quality, and "it is impossible that Georgian wine, which is exported to EU, does not comply with Russia's standards." "The quality of Georgian wine has strongly improved ... The government will strictly control its quality", - concluded the minister. 19.11. 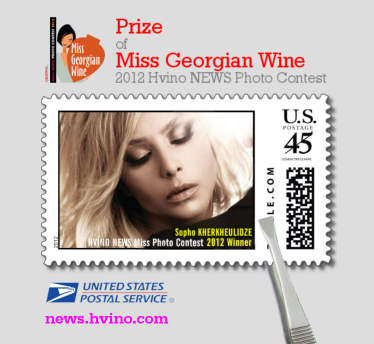 2012 (Hvino News) The US Postal Service has approved postage stamp with the image of Miss Georgian Wine 2012. “We are glad to issue this unusual prize for Miss Georgian Wine 2012. The stamp also promotes Georgia worldwide – which is the main objective of Hvino News and other projects of Hvino.com. We have already started to accept photos for 2013 Contest, and we hope our next year’s prize will be a national Georgian stamp. 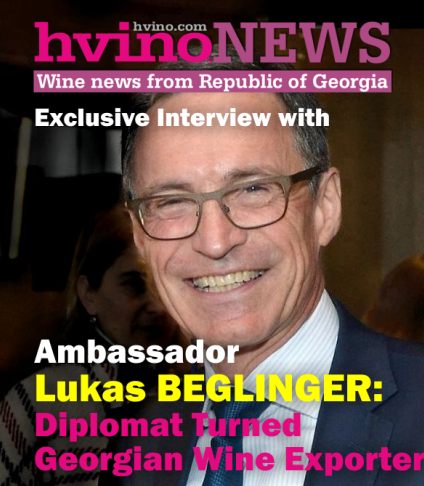 We would welcome Georgian Postal Service to partner in Miss Georgian Wine,” – said Alexander Kaffka, publisher of Hvino News. “We have heard questions why this stamp bears winning image, but not the contest’s logo or official title. According to strict rules of US Postal Service the word “wine” is considered as advocating drinking, so we had to avoid it in our design to be accepted by American authorities. That’s another reason why we want to issue our next prize stamp in Georgia, where wine is a piece of national culture” – he adds. 17.11. 2012 (Hvino News). British newspaper "Financial Times" in its yesterday's edition published a large article on tourism in Georgia. 17.11.2012 (Hvino News). The long-awaited return of banned Georgian wine and mineral water to huge Russian market seems to approach. Last week was full of high-level signals coming from both sides, which communicate positive message to eager market players as well as thirsty consumers. Relations between Georgia and Russia are still at nearly lowest possible level. Let’s say they are a tiny bit above the lowest level. What has been once a total vacuum for citizens of two countries – absence of diplomatic relations, ban on visa issuance, lack of direct transportation means – became slightly better with introduction of direct airline service and one-sided visa-free regime for entry to Georgia. But this is not a breathable atmosphere, because entry to Russia is still practically closed to most Georgians including businesspeople. Recent political change in Georgia gave hope of fresh air to the breathless contacts between two nations. Comeback of Georgian wine and Borjomi – country’s “signature products” - to Russia will seemingly be the first tangible dividend of that kind. 16.11.2012 (Hvino News). Georgian wine industry leaders made comments in connection with recent signals from Tbilisi and Moscow regarding possible lifting of the ban on Georgian wines and mineral water in Russia. Giorgi Margvelashvili, director of Tbilvino, stated they have been waiting for recovery of export to Russian market for a long time. He said to radio Commersant that products of Georgian wine companies fully comply with quality standards. Levan Davitashvili, commercial director of Schuchmann Wines said that if it is an open and free return to the Russian market, it can be only welcomed. 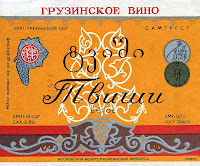 In recent weeks, other Georgian wine companies have also made statements in favour of Russian market. For example, Levan Mildiani, owner of Midiani wine company, said in a Russian television programme: "We are prepared to ship our wine to Russia even tomorrow" (read more here). Russian Chief Sanitary Inspector Gennady Onishchenko said that 8 Georgian companies are likely to get permits to export wines to Russia. Russia banned imports of Georgian wine in 2006. 16.11.2012 (Hvino News). Russian Chief Sanitary Inspector Gennady Onishchenko said that 8 Georgian companies requesting permits to sell wine in Russia will have their enterprises inspected by Russian specialists, - reported Russian news agency Interfax. Previously, these companies have applied to our department, their documents have been processed. Now Russian experts should visit them for on-site inspection and to issue the official permit to Russian market. "If the inspectors Rospotrebnadzor are satisfied with the results of inspection, we will offer the companies which have passed the inspection, to provide their products for registration to allow it to the Russian market," - said Onishchenko. 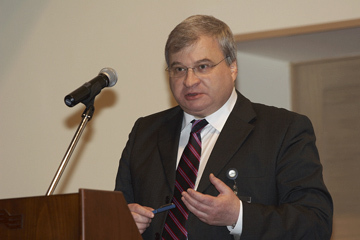 Russian Deputy Foreign Minister Andrey Denisov said on November 14 that the sides were ready for practical measures to return Georgian wine to the Russian market. Russia banned imports of Georgian wine in 2006. Georgia used to export 60 million bottles. 15.11.2012. Georgia plans to negotiate the resumption of its wine exports to Russia in the near future, Georgian Agriculture Minister David Kirvalidze said on Thursday, radio Voice of Russia reports today. He promised to meet Russian experts’ demands obliging Georgian officials to take better control of wine, due to be delivered to Russia. Kirvalidze was echoed by Russian First Deputy Foreign Minister Andrei Denisov, who confirmed the two sides’ readiness to settle the matter [see here]. Russia banned imports of Georgian wines and two popular brands of mineral water in 2006, citing the poor quality of the products. 15.11.2012. 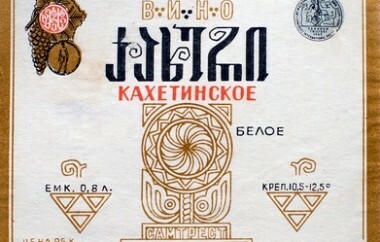 For six years, Russian supermarket shelves have not stocked Georgian wines or mineral waters, which have always held a special place in the Soviet and then the Russian psyche. The ban, which was ostensibly for health reasons but was clearly politically motivated, may now be lifted after a change of government in Georgia. Russia’s health and sanitary agency banned all imports of wine and water from Georgia in 2006, as relations between the two countries deteriorated prior to the brief war they fought in 2008. The move stripped Georgia, a largely agrarian country, of its largest market, and forced Russians visiting the hundreds of Georgian restaurants in the country to wash down their meals with French or Italian wines. 15.11.2012 (Hvino News). "Russia and Georgia are ready to solve practically the issue of returning Georgian wine into the Russian market. The supply of Georgian wine into Russia was banned in 2006", - said Andrey Denisov, Russia's First Deputy Minister of Foreign Affairs yesterday. 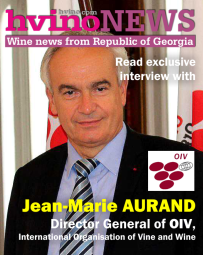 “We are talking about the restoring the position of Georgian winemaking in our market. At least the both sides are ready to solve the issue”, said Mr. Denisov. This statement is quoted by Russian newspaper Vedomosti. In 2006 Russia's Rospotrebnadzor (Federal service on customers' rights protection and human well-being surveillance) banned import of Georgian wines and mineral water Borjomi into Russia explaining it by poor quality of product. Since then the sides have been discussing repeatedly the return of the Georgian wine into the Russian market. 13.11.2012 (Hvino News). 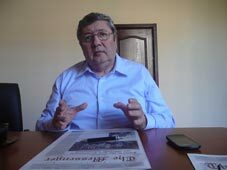 Georgia's Agriculture Minister David Kirvalidze believes that no matter what are the risks of Russian market, it is very interesting. The minister said that wineries must diversify export markets and develop new markets. "You can not always stick to the same market. This was a mistake of some producers, who did not seek for alternatives. There were companies which sold 400,000 bottles per month, while in the U.S. market we have not even reached the level of 100 thousand bottles. If you are afraid of wolves - do not to go into the forest [a proverb - HN], "- said Kirvalidze. According to the minister, after the Prime Minister appointed Zurab Abashidze as official representative on Russia, relations between the two countries have intensified. "We know that by Gennady Onishchenko made several verbal statements on preparedness. We have also stated that we are willing to receive [Russian experts- HN], and the business has expressed its position. Then there was the question from their side whether we would not obstruct these processes. Why obstruct - to the contrary, we will do our best to help them, because the Russian market is the market where everyone wants to enter "- said Kirvalidze. 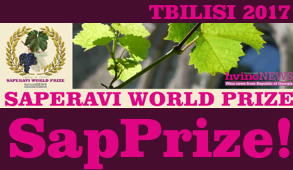 "Hvino News" Contest results: Miss Georgian Wine 2012 announced! 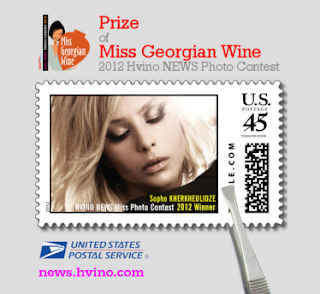 In August Hvino News announced Miss Georgian Wine Photo Contest, supported also by Georgia Today newspaper. Our readers have been voting - by "liking" on our special Facebook page - for the best photograph presented to our Contest. 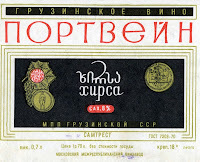 The Contest, which lasted through November, was open to everyone whose work was related to Georgian wine. Now it is our great pleasure to announce the winner of Miss Georgian Wine 2012! And the winner is Sopho Kherkheulidze. The organizers wish to thank all the contestants who submitted their photos, and all the readers who have voted. Sopho Kherkheulidze works at Sarajishvili Company - the famous brandy and wine manufacturing enterprise. Our sincere congratulations to her! The winning photo is presented here. 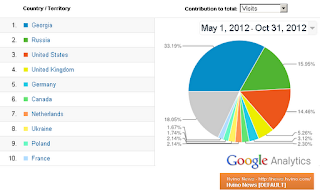 "Hvino News" reaches public in 100 countries of the world! 10.11.2012. Hvino News is pleased to announce statistical data for the first 6 months of our operation (Hvino News was opened officially on May 1st). The total geographical reach of our news service during 6 months is exactly 100 countries of the world! In summer our readership was 57 countries, so we have a really impressive growth of this important parameter. 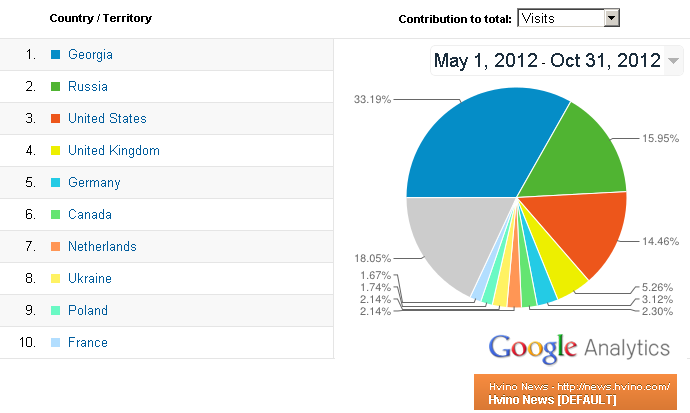 The diagram shows geographical location of our readers according to Google Analytics during May 1 - November 1. 33% of visitors come from Georgia, 16% - from Russia, 17% - from USA and Canada, 5% - from UK. Among "other countries" (grey-coloured sector) most visits are from Hong Kong. 09.11.2012 (Hvino News) Georgia won 41 awards in the 2012's Cathay Pacific Hong Kong International Wine & Spirit Competition. “Now the Georgian wine industry produces a high quality product but there is a lot of competition around the world and unless some very serious measures are taken in the direction of marketing there will be no serious results. Special efforts should be taken in the direction of worldwide promotion of Georgian wine. 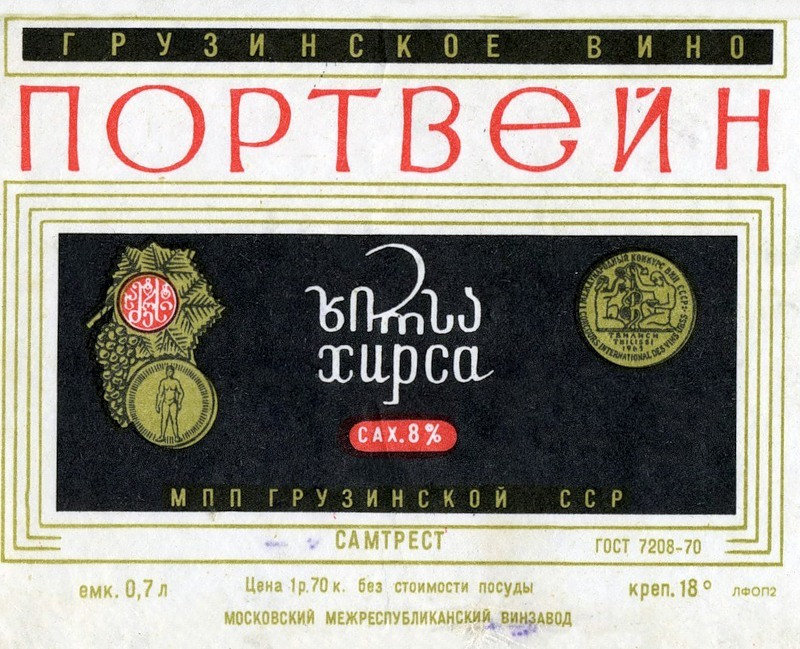 The quality of Georgian wines is up to international standards. But the general public doesn't know much about Georgian wine, either in Europe, Asia or further afield. A professional, solid and aggressive marketing policy should be launched for promoting Georgian products abroad. 08.11.2012. Muslims head to Mecca, Jews and Christians to Jerusalem. I journeyed 6,000 miles to The Republic of Georgia to pay homage to the birthplace of winemaking. Few recognize its cultural gravitas and even fewer travel here, and yet, for Georgians the "gospel" of wine is arguably as important as their religion. 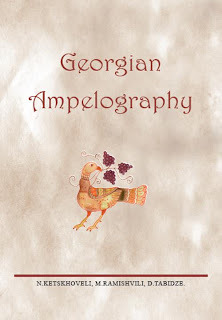 Embraced so universally and fervently, wine, and later winemaking, emanated from Georgia only as quickly and extensively as humans could travel, until all corners of the earth recognized its name. Waves of wine eventually crashed on all shores of the world, but I often wonder to what extent it affected those living there. Was it coincidence, correlation, or, dare I suggest, causation, that the founding tenets of winemaking emerged alongside the first signs of civilization? Crudely put, man was drinking wine as his grunts became conversation, and copper tools replaced stone ones. From the time of its debut nearly 8,000 years ago until the present day, wine has been recognized for its socially transformative powers. Greek historian Thucydides observed in the 5th century BC, "The peoples of the Mediterranean began to emerge from barbarism when they learnt to cultivate the olive and the vine." Twenty-five hundred years later, Ernest Hemingway, undoubtedly speaking from extensive personal experience, stated, "Wine is one of the most civilized things in the world". 08.11.2012 (Hvino News). 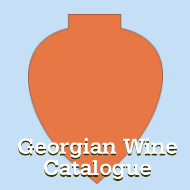 In January-September this year, Georgia exported 13,492 tons of natural grape wines, which is by 26.5% less than during the same period in 2011, - according to National Statistical Service "Geostat", quoted by Russian news agency Interfax. At the same time, the revenue from the export of Georgian wine during 9 months increased by 18.4% to $42.6 million, representing 2.4% of total exports. Export of brandy, vodka and other spirits in January-September increased by 27.7% to 17,150 tons; in revenue - by 45.6% to $61.3 million (3.5% of total exports). Biggest importer of Georgian wines and spirits is Ukraine: total import was worth $47.2 million, including $19.2 million of wine. Georgia exports wine and spirits to 40 countries. The first three largest importers of Georgian wine are Ukraine, Kazakhstan and Belarus. According to government's strategic plan, by 2015 the country's wine production and export revenue are supposed to grow by 50% in comparison to 2011. Marani Alazani Valley Rose 2011 (Bronze). Heads of Jury were Mariusz Kapczyński and Wojciech Bosak. The competition is for producers and importers of wine, which are exhibitors of ENOEXPO 2012 or independent companies. Participants can enter the wines which are well known and available in Poland, and those that they are planning to introduce in the Polish market. 02.11.1012. Minister of Agriculture of Georgia says the negotiations with the Russian government would begin soon to discuss the return of Georgian wine and mineral water to the Russian Federation. 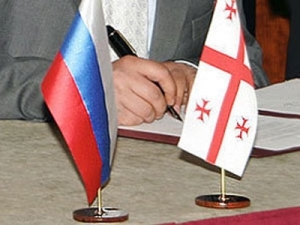 Minister commented on the issue after the Prime Minister appointed former ambassador to Russia, Zurab Abashidze as his personal representative for the regulation of Georgia-Russia relations. Zurab Abashidze says that Moscow will be officially informed about yesterday`s decision and afterwards, Georgian side will be waiting for responding steps. `Now the main thing is to get the reaction from Russia. Yesterday`s decision will be sent to Moscow via diplomatic ties and afterwards, we`ll be waiting for their reaction. We wish their reaction were positive and only afterwards, we`ll contact the Russian side to agree on format of meetings and negotiations,` Zurab Abashidze said. 02.11.2012. ACLASS, one of three brands under the ANSI-ASQ National Accreditation Board and the American National Standards Institute (ANSI), recently awarded international accreditation certificates to Multitest and Wine Laboratory, its first accreditations in the nation of Georgia. (See also: Accredited local laboratories to increase agriculture export, and U.S. Government supports international certification opportunities for Georgian agriculture products). 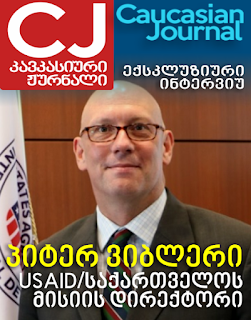 The accreditations are part of ANSI’s larger collaborative effort with the United States Agency for International Development (USAID)’s Economic Prosperity Initiative (EPI) – a $40 million program overseen by Deloitte Consulting LLP and a group of U.S. and Georgian economic experts – and the Georgia Accreditation Center (GAC) to bolster Georgian exports and overall economic growth through improvements to the country’s accreditation and conformity assessment. 02.10.2012. “All our conditions are already known. 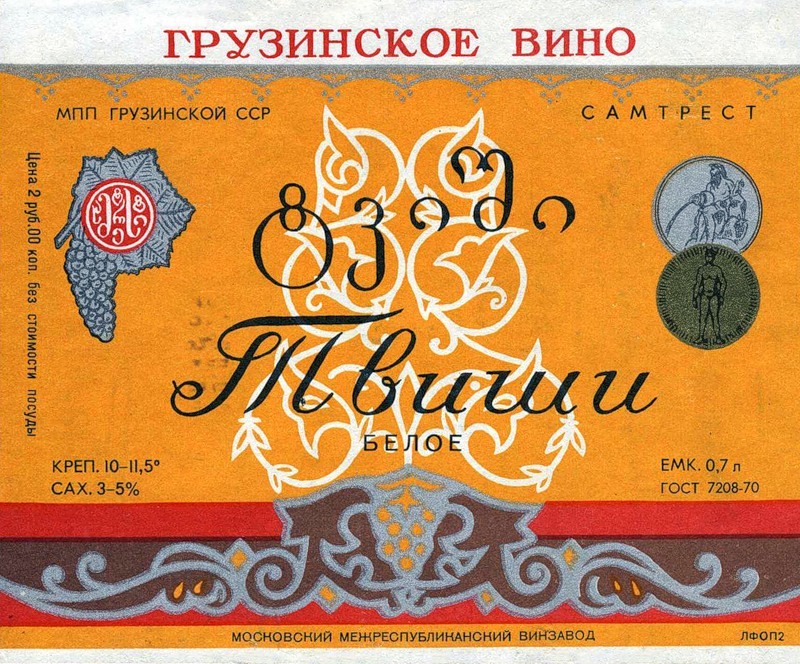 If they enable us to visit the factories and show us the necessary documentation, Georgian wine may appear in our country. Why not?" - Gennady Onishchenko told newspaper Izvestia. Russia’s chief sanitary doctor states that Russia’s embargo on Georgian wines was caused by the number of falsified products. Regarding the political motives of the decision, Onishchenko says that Georgia’s leader is responsible for this, who doesn’t give the right to Georgian wine makers to develop trade relations with Russia and threatens them with “hanging”. Onishchenko mentioned Georgia as a quasi-national territorial formation. “But today, Georgian business and not the government did a lot to stop the falsified product. I don’t rule out in case of other such measures that soon Georgian wines will be sold in Russia”, he said. 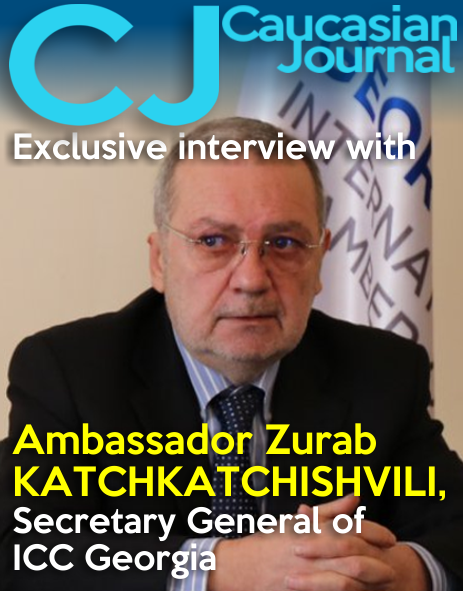 Onishchenko's interview was published by Izvestia after Georgia’s Prime Minister Bidzina Ivanishvili introduced Zurab Abashize as his special representative for relations with Russia and said his primary task was restoring cultural and economic relations with Russia. 01.11.2012. An international recruitment firm, Brachin International Headhunters, is helping Winery Khareba expand into markets in Asia. Winery Khareba, a world class wine producer, has won various awards at the Hong Kong International Wine and Spirit Competition including the China Wine Award in 2011. This year they won the Les Citadelles du Vin, Bordeaux 2012, Saperavi Premium award. The company maintains a unique vine culture and makes wine using both ancient methods and modern technologies. Winery Khareba will be attending this year's Hong Kong International Wine and Spirit Fair (HKTDC) on the 8th, 9th and 10th of November at the Hong Kong Convention and Exhibition Centre, booth number: 3CON-040. Because import taxes have been reduced for wine products in Hong Kong, it is today the gateway to Asia for wine products. Thus, international recruitment firm Brachin is actively recruiting sales staff with beverage industry experience in Hong Kong. “Brachin is an international executive search firm and a strategic international partner for us. Brachin knows the local countries and our business. We are impressed with their agility, responsiveness and their ability to execute at a reasonable cost,” said Levan Zhvania, Winery Khareba’s CEO. 01.11.2012. Today Hvino News is 6 months old! A small baby in human terms, but already a well established media project. Our team constantly works to make our information service better, and today we are happy to broaden our scope by including tourism and hospitality news from Georgia. On November 1 we are officially launching our "sister" news project Hvino TOUR NEWS (HTN) at http://tour.hvino.com, which delivers tourism industry news from Georgia. Since September - during over a month's period - HTN has been fully operating, and today it is finally announced. Hvino TOUR NEWS will help in international promotion of Georgian tourism industry by uniting all news, press releases, and media articles in English "under one roof". 31.10.2012. Georgian wine and water may reappear on Russian market soon as both countries appear ready to resume trade relations. Georgian wine and spirit producers gird loins to undertake the quality-related procedures put out by Russian side in order to admit Georgian product back after 7 years of trade halt. Genadi Onishchenko, head of RosPotrebNadzor, the chief sanitary service of Russian Federation, sent inviting signals past week and official Tbilisi said yes. Based on Russian media, Onishchenko appears ready to discuss applications of Georgian wine and mineral companies in order to admit them on Russian market if new Georgian government does not hamper the process. He also reminds Georgian entrepreneurs that the essential precondition for approval is arrival of trusted Russian specialist in Georgia to carry out on-spot inspections of applicant companies.